There are a few different varieties of dragonfruit (a.k.a. pitahaya or pitaya). The most common variety has a thick, deep pinkish red, leathery skin with flame-like green spikes. There are the white and blood-red flesh varieties with tiny black seeds, and the pitaya amarilla that has yellow skin with white flesh inside. How did dragonfruit get its fancy name? It has this almost scaly, flame-like green spikes (not thorny), but look also at its flowers and you will understand why. For the very “dressy” skin and fancy name, dragonfruit flesh has a rather bland taste with a melon-like texture and crunchy seeds like the kiwifruit’s. The dragonfruit is dense with phytonutrients. They are rich in antioxidants, the B vitamins, vitamin C, as well as polyunsaturated fatty acids, carotene and protein. They also contain high amounts of calcium, iron and phosphorus. 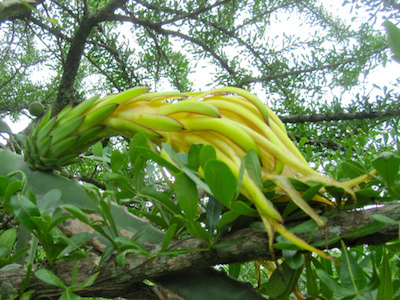 Dragonfruit seeds are high in polyunsaturated fats such as omega-3 and omega-6 fatty acids. 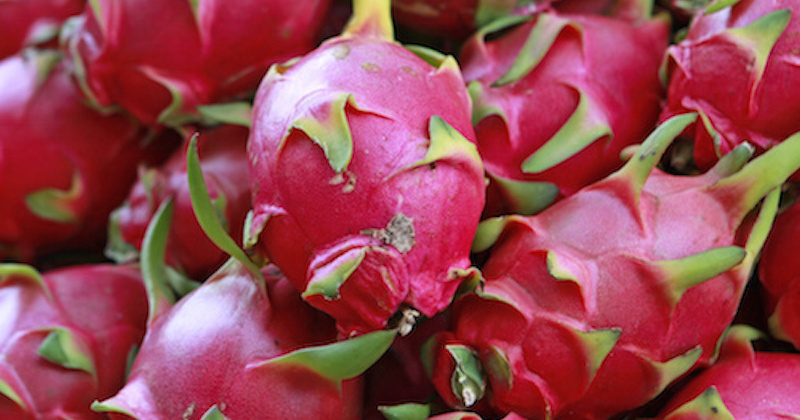 Acne: Dragonfruit is rich in vitamin C and is a great topical ointment. A slice of dragonfruit can be turned into a paste and applied to red area on your face and skin, then rinsed off with warm water. Anti-aging: Eating dragonfruit can help keep skin tight and looking young because of its high antioxidant content. Anti-inflammatory: Due to its high content of antioxidants in phytonutrients, pitaya has excellent anti-inflammatory properties that may be beneficial to prevent inflammatory issues like gout, arthritis and asthma. Cancer: The antioxidant protection from vitamin C can boost the immune system and the carotene component of dragonfruit has been connected with several anti-carcinogenic qualities, as well as reduces the size of tumors. Cardiovascular health: Dragonfruit contains no cholesterol and hardly any unhealthy, cholesterol-producing fats. When you reduce the amount of cholesterol in the blood, your chances of developing plaque buildup in the arteries and veins is lower. The seeds in dragonfruit contain positive types of fat, which can cause HDL cholesterol that actively lowers the amount of LDL cholesterol by reducing the receptors that holds onto the walls of the arteries. Constipation: Individuals suffering from constipation may benefit from eating one dragonfruit a day. The rich dietary fiber is useful for helping improve bowel movements. Detox: Dragonfruit can assist the body with normal functions such as assisting with getting rid of toxic heavy metals. Diabetes: Dragonfruit is not sweet and is a suitable food for diabetics. It contains a high amount of fiber that can help regulate and stabilize blood sugar levels and suppress sugar spikes. Digestive health: Dragonfruit can help clean your digestive system because of its high fiber content, which can improve poor digestion and constipation. The flesh and seeds are high in good proteins and will keep your body fortified and content. When you regulate bowel function with dietary fiber, you lower your chances of conditions like constipation, irritable bowel syndrome, and colorectal cancer. Heart health: Dragonfruit has high content of antioxidants that makes it great for reducing oxidation of cholesterol. It is a good source of monounsaturated fats that helps the heart stay in healthy condition. Immune system health: One of the amazing benefits of dragonfruit is the ability to give your body’s defense system a huge boost. Dragonfruit has very high levels of vitamin C which is one of the strongest resources for your body’s immune system; it also encourages other antioxidant activities in the body. It actively finds and neutralize free radicals, which are dangerous byproducts of cell metabolism, and have been linked to potentially fatal diseases like cancer. Respiratory health: The high vitamin C and antioxidants in pitaya makes this pretty fruit beneficial for healing respiratory problems such as asthma, bronchitis or wheezing. Soothe sunburn: The high amount of antioxidants and nutrients in dragonfruit may make it suitable to moisturize sunburned skin. Combine with cucumber juice and honey and use this mixture to release heat sensation from the affected area. Choose a bright red or pink dragonfruit that is fully ripe, press the flesh and if it gives in a little it is probably ripe enough to enjoy. Dragonfruits are best served chilled and sliced into cubes or they can be blended into a delicious smoothie. Dragonfruit sorbet is easily made with just a few ingredients and is yummy on a hot summer day. See how to peel dragonfruit skin and make a nice summer slushie. Dragonfruit is just a very pleasant fruit to be enjoyed and has no health risks associated with it. Studies have proven that pregnant and breastfeeding women may eat dragonfruit without any health issues/reactions or risks.